Bad posture can raise your blood pressure due to a link between the neck muscles and the part of the brain stem that regulates it. Obesity can cause bad posture by forcing the spine to misalign as it tries to distribute the weight evenly. 33 vertebrae will fuse together as we get older, leaving adults with 26. Posture is the position in which we hold our body while we sit, stand or lie down. In order to prevent “bad” posture and reduce the chances of suffering from posture conditions, we can train our body to sit, walk, stand and lie straight so that less strain is placed on our muscles and ligaments. 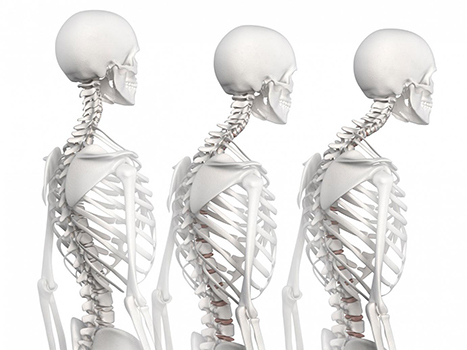 Many conditions that affect the skeletal system will affect our posture. Scoliosis, kyphosis and lordosis are just a few conditions that can cause a serious postural deformity. Kyphosis usually known as “Hunchback” manifests itself as forward rounding in the upper portion of the back, often it’s a severe rounding of more than 50 degrees according to the National Scoliosis Foundation. Kyphosis can occur during development or it can be caused through osteoporosis, arthritis, a fracture or from a trauma to the spine. In its mildest form, Kyphosis generally doesn’t cause any major health concerns. Severe kyphosis can cause damage to the nerves, tissues, lungs and organs and it can be extremely painful. Kyphosis can strike at any age which will also depend on the treatment. The options available are; anti-inflammatory medications, exercise, bracing or surgery. 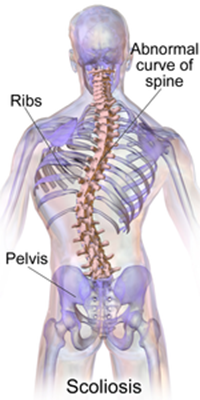 Scoliosis occurs where there is a curvature in a person’s spine that curves from side to side. The National Scoliosis Foundation reports that seven million Americans are affected. Scoliosis can affect infants, children and adults, although it usually occurs between the ages of 10 and 15. Females are eight times more likely to be affected by scoliosis than males. It can cause considerable pain, reduce normal respiratory functions, prevent normal activities and affect the sufferers’ self-confidence. The main treatment for scoliosis is bracing. If this is unsuccessful, a spinal fusion can help to correct the curvature of the spine. 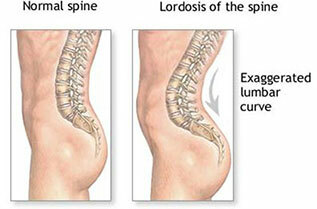 Lumbar lordosis is a much exaggerated curvature of the lower back. It often appears as though the back is swaying, or the lower body appears to be standing outwards. Lordosis is usually the result of conditions such as cerebral palsy, muscular dystrophy or spinal muscular atrophy. It can also develop gradually over time if hip muscles are weak or tight. The treatments available are surgery or physical therapy. There are many other conditions that can cause a postural deformity. Spinal infections can weaken the surrounding bone and tissue which then results in a curve. Before antibiotics, conditions such as TB (tuberculosis) and Polio were known to create a curved spine. 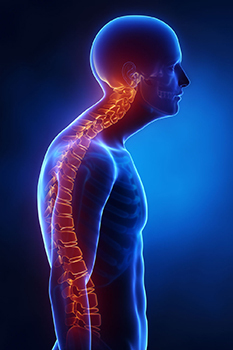 Spinal fractures and tumors can also lead to postural conditions. Children who are still growing and undergo radiation therapy can experience stunted growth of bones and a spinal curvature as a side effect of treatment.